Eliminate unwanted pet odors with the revolutionary power of Nok-Out! Nok-Out is so versatile for dog and horse owners you can't do without it! Non-Toxic, Biodegradable, Fragrance Free, and Hypoallergenic, Hospital Disinfectant Nok-Out; an antimicrobial cleaning and disinfecting agent which is a stabilized chlorine dioxide product that is EPA Registered as a safe, dependable broad spectrum disinfectant. Nok-Out Odor Eliminator's ability to remove odors and unpleasant smells in the home is a definite plus to it's ability to disinfect safely. As an oxidizer, Nok-Out MUST come into direct contact with the odor causing substance to do it's work. When Nok-Out does come into contact with something smelly, it changes that smelly stuff to something that no longer has an odor. Non-Toxic, Biodegradable, Fragrance Free, and Hypoallergenic, Hospital Disinfectant Nok-Out; an antimicrobial cleaning and disinfecting agent which is a stabilized chlorine dioxide product that is EPA Registered as a safe, dependable broad spectrum disinfectant. Disinfectant Nok-Out has powerful, cumulative, long-lasting effects that kill viruses, bacteria, mold and mildew - in addition to totally eliminating noxious odors from organics, inorganics, and pathogens. Nok-Out works topically to remove all odors and disinfect. It penetrates to destroy embedded problems. Where Can I Use Nok-Out In My Home Or Office? This product is perfect for the bathroom/toilet, kitchen counters, baby's room, sickrooms, automobile, anywhere pathogens exist in your home or vehicle. The completely safe and biodegradable solution for any job requiring a supremely effective disinfectant and deodorizer. How Is Nok-Out Useful For My Barn? 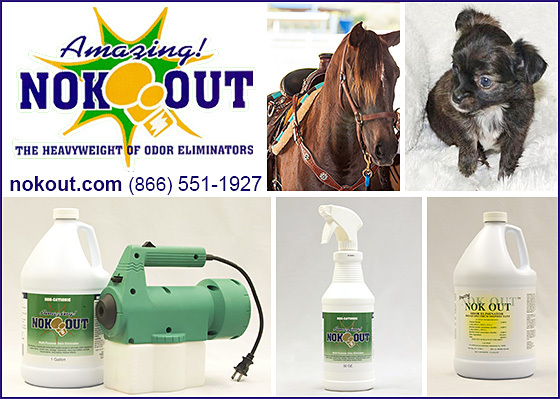 Eliminate Odor: Spray Nok-Out on flooring every time you clean out the stall. Spray fresh straw or other bedding used to inhibit odor formation. Pay particular attention to corners of the barn and stalls, around the door facings, both in and outside. (Horses usually don’t defecate or urinate in the barn, but will do so before entering and leaving. Spray these sites well daily. Enhance Air Quality: Spray the air with a fogger/mister for the best effect. Do this daily. You may dilute with water (50/50%) without fear of reducing the good effects of Nok-Out. Sanitize Tack: Apply Nok-Out directly to saddles, blankets, harnesses, etc. to sanitize and deodorize odors of sweat and animal odor. Allow to air dry. This procedure may be done before placing blankets and saddle on the horse, or immediately after riding. Control Insect Population: Regular spraying with Nok-Out inhibits insects from nesting in bedding, or from the barn. You will notice a significant reduction in flies and larvae activity. A sprayer system is available upon request, and is ideal for large barns. How Do I Use Nok-Out In My Home For Pet Odors? What Do Customers Say About Nok-Out? I just got your product 2 days ago. I was able to use it on out carpet today. I am very pleased with how much better our house smells. Due to our dog developing canine diabetes, she had multiple accidents throughout the house. Many of which had set in due to our not being able to find the accidents right away. I used all kinds of pet odor removers and cleaners (store brand) but none worked. I addition, when I called to order Nok Out, Ted took the time to help me make sure that I understood how to use the product correctly and effectively. This personalized help he made helped a great deal in using it correctly. I highly recommend this product. I will definitely reorder, when times comes. This is the first product I've ever wanted to write a testimonial for. A lady who allowed her dog to urinate and defecate during the summer while she was moving, left us with the most horrendous smell. The smell was through the entire house. The carpet throughout the house was ruined. Under the carpet was old small tiles. We used bleach, different cleaners NOTHING touched the smell until we used Nok-Out. After one use we could smell a difference. We were told the smell could come back up through the tiles so we did a second application just to be safe. I cannot say enough good things about Nok-Out. If you have severe dog smells like we did use Nok-Out; you won't be disappointed. First and foremost: Nok-Out simply works. And that is the reason that you buy it. Secondly, customer service with this company is superb! Fast, friendly, and efficient. They are a joy to do business with. Here at InfoHorse.com we are involved with a lot of animal rescue and there are always animals at the office. We were amazed at the effectiveness of Nok-Out on our tiled floors. Urine smells and dog odors just vanish. This is an amazing product. Your home, office, barns, stalls, and pet areas can be free of odors. No more stinky tile, carpets and furniture. Nothing out-performs Nok-Out. For more information about Nok-Out, please call or email us today-- or order through AMAZON for convenience!